I just spent three days in the Cameron Highlands, about 200km north of Kuala Lumpur, the capital of Malaysia. The area is mountainous – about 1,110-1,600m (3,600-5,200ft) above sea level – full of twisting roads and blind turns. It has a “tropical highland climate” – which means the weather is cool, which I loved! It was developed in the 1930s, making it one of the oldest tourist spots in Malaysia. It was a spur of the moment trip. I needed to leave China for visa reasons, but after the stress of the past few weeks I decided to look into a short getaway somewhere rather than a simple border cross. I had a travel voucher from Air Asia (after a delayed flight back in December) and I’d heard the highlands were a nice spot, so I just went for it. Views along the narrow forested road to the bungalow. 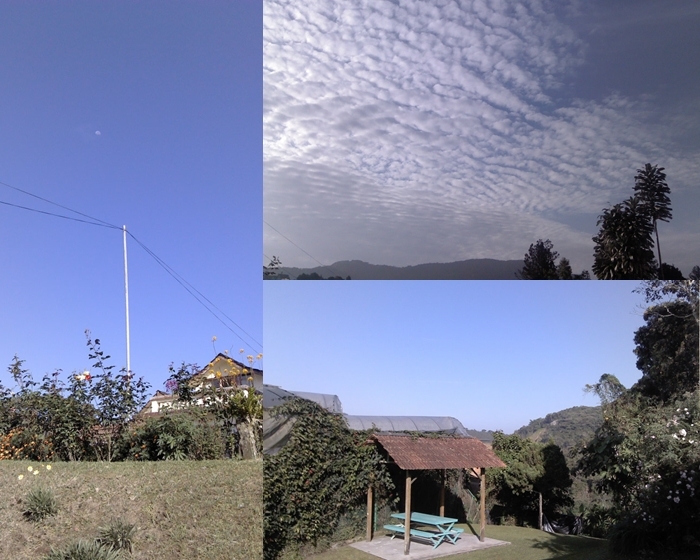 I stayed at the Lutheran Mission Bungalow, a small property built in the 1930s on top of a hill 5km north of Tanah Rata. It was peaceful and beautiful. 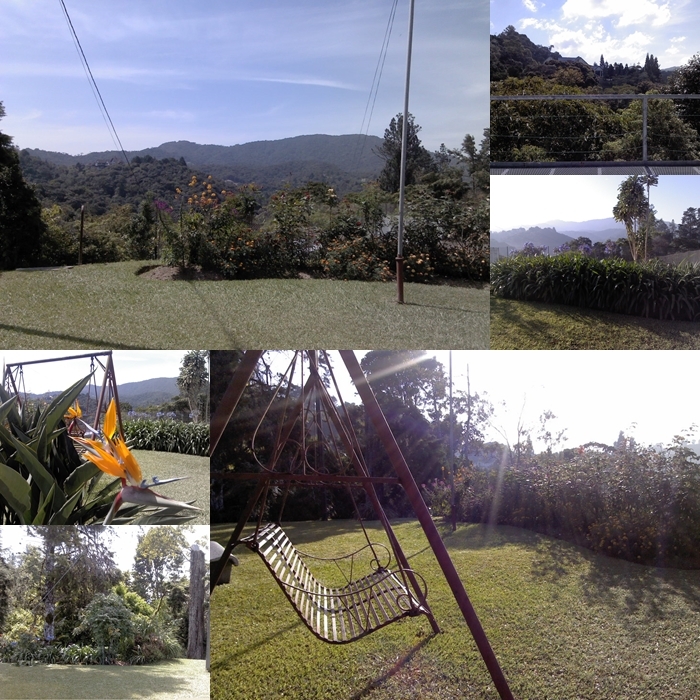 I loved the neatly kept gardens, and the views of misty rainforested hills. Every day the weather was slightly different. One morning was all clouded over, the next dazzling sunlight, the third somewhere in between – and each quite beautiful. There were numerous benches and metal chair swings, and even a metal platform with wooden benches built low on the property, all of which gave a lovely view of the surrounding hills. View from the platform on a sunny morning. I didn’t see much of the Cameron Highlands area, and its sights. I did very little, in fact, but soak up the atmosphere – the peace and quiet, the rainforest, the flowers… I slept a lot, even took naps. I read. I listened to music. I sat in the sun. I did cross-stitch. I listened to audiobooks. I went on walks. Each day I had breakfast and dinner at the guesthouse, and during the day took a trip to Tanah Rata – walking half an hour down the hill to the main road and picking up a taxi into town. I thoroughly enjoyed walking in the highland rainforest. It was beautiful, whether bright and sunny or misted through. All the roads in the area wind up and down and around in tight hairpin turns, which meant even on foot I had fun trying to work out on which hilltop the bungalow sat. In Tanah Rata I bought a few bits and pieces, had a little online time, and mostly just chilled in cafes. The taxis are also worth mentioning. About half the taxis I saw around Tanah Rata were really old Mercedes sedans. I couldn’t peg their exact age but everything in them was analogue – including the clocks set into the dashboards. My first cab was the oldest one I saw – a 190D, with two bench seats and no seatbelts. After a quick look online, I think it was probably a 1960 model! I also saw several late 70s/early 80s models – a 230, a 240D, and a 240E. Cameron Highlands has lots of tea estates and strawberry farms – the two most famous products of the area. I didn’t try the tea, but the strawberries were delicious! I was served a bowl of fresh strawberries with a little ice cream after dinner one night and thought to myself “well, the place is known for its strawberries, I’ll just have one or two” but once I tasted them I kept justifying and saying “just one more” until I’d finished the whole bowl! They were the best strawberries I’ve ever had – deep red all the way through, full of flavour and vine-ripened sweetness. They were dense, but soft, and not at all watery. Amazing! I wonder if they came from the neighbouring strawberry farm. I could see through the screen of passionfruit vines and was interested to note that the strawberries grow in plastic troughs on wooden frames, so that workers don’t have to crouch to tend the plants. I really enjoyed just sitting in the gardens. They reminded me a little of my grandfather’s garden – well kept lawns with neat, curved flower beds containing layers of brightly coloured blooms. There were roses, climbing roses, lillies, orchids, birds of paradise, hibiscus, passionfruit, daisies, dahlias, fuschias, bottlebrush, hydrangeas, marigolds, begonias, geraniums, agapanthas, nasturtiums, and more I couldn’t identify. Then the lawns fell down steep slopes into the wild tangle of rainforest. In fact, apart from the surrounding rainforest the property as a whole somehow reminded me of the farmhouse where my mum grew up (and which I loved visiting as a little kid) which added to its charm and comfort. Overall, I think what refreshed me most was engaging my senses. One of the things I find hardest about life in Beijing is how “distant” I feel from anything natural – between pollution and walls and not being allowed to sit on the grass, and not being able to just “be” outside without being stared at and talked about/to by a dozen strangers. So each day on this trip I spent an hour or two simply sitting outside. Birds swooping around overhead; dew evaporating off roses; huge bumblebees bumbling around agapantha flowers; layers of clouds dancing so close that I felt I could almost reach out and touch them. Bird calls from all directions overlapping each other; buzzing insects; croaking frogs; trickling water; rumble of distant machinery; the haunting melodies of amplified calls to worship from the local mosque. Warm sunlight on my skin; fierce sunlight beating down; soft, springy grass beneath my feet. June 20, 2014 in Travel Stories.